The success of the Colorado Model has now prompted organizational campaigns like Battleground Texas, an organization targeting Texan youth and minorities to vote progressive, to attempt to repeat the effective model. Colorado’s political shift should serve as a warning to Texas. Colorado was once a bastion of economic opportunity, but progressive polices have robbed the state of its economic prosperity. Texas must not sway from the path of economic opportunity to be enslaved by policies of progressivism. When Colorado was a conservative Republican state, the state was a beacon of freedom in the United States. The state had balanced budgets, low taxation, and relatively low amounts of debt. 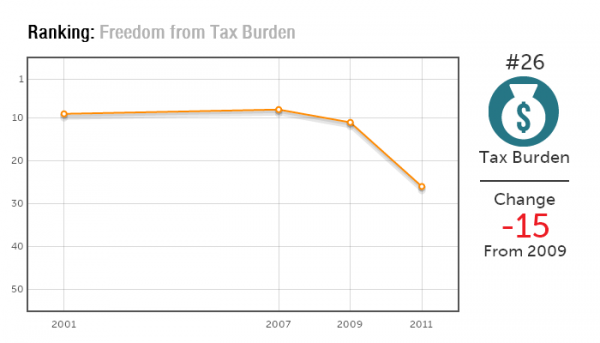 As Colorado became dominated by progressives, economic and personal freedom slowly declined. The Mercatus Center of George Mason University analyzes state policy impacts on individual and market freedom in the “Freedom in the 50 States” study. According to the Mercatus Center, Colorado has seen the greatest slip in the freedom rankings since the recent election cycle. In 2007, Colorado ranked 4th freest state in the Union. In four years, as progressive policies were widely implemented, Colorado’s freedom ranking plummeted to 19th . Colorado’s major shift in rankings comes primarily from tax and fiscal policies (as seen in the charts below). The State’s net taxation burden increased from 8.3 percent to 9.2 percent in the FY2006-FY2010. Over the same period, Colorado’s debt increased by 3.6 percent and still continues to grow. The Independent Institute agreed that Colorado has serious spending problems. The Institute explained that Colorado’s policies are likely “discouraging both job creation by private employers and job seeking by individuals.” The once conservative state which ranked 4th overall with the most economic opportunity has fallen far as a result of the progressive Colorado Model. In addition to rising debt and taxes, Colorado enacted a plethora of economically harmful regulation. Labor laws are unattractive and Colorado is put at a disadvantage to other states. Colorado ratified wage controls resulting in higher unemployment rates and its health insurance mandates have made medical care substantially more expensive compared to other states. In four years, Colorado’s economic outlook has declined dramatically. Personal liberty in Colorado has not fared any better. Since Democrats have taken control of Colorado leadership, Civil Liberty rankings have plummeted from 17rd to 33rd of all of the States. Recent gun control laws have driven away a popular hunting industry which brought almost $2 billion of private spending to the state. As well, increasingly restrictive education policies targeting private and home educated students have deterred families from immigrating..
Battleground Texas plans to emulate Colorado to turn Texas into a blue state. Colorado’s weakened economy and evaporating freedoms should remind Texas of the effects of ‘progressive’ policies upon economic and personal freedom. Texas has been a land of prosperity and opportunity. This will only continue as long as Texas resists progressivism. The Achilles heel of Colorado is the legalization of wacky weed. Perhaps in the next election cycle those young folks and minorities will be so wacked out they might overlook election day or find it generates too much effort to locate their precinct.. Those who feel nothing eventually do nothing which is the physical reaction to marijuana.